Luckenbach, Texas celebrates Texas Independence. 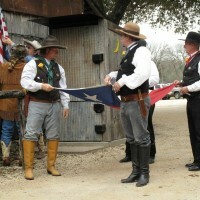 Official Texas Flag retirement ceremony with Texas Rangers. Starting at noon, Brian Burns and Doug Moreland entertain and present history through music. The Texas Star Trail Ride comes through town around 3 to 4 pm – it’s a sight to behold. Then to end the day, Dusty Britches and The Rhythm Ranch Hands will be in the dancehall at 8 pm and there is no cover charge. For more information, call (830) 997-3224 or (888) 311-8990.